Tonsillitis simply means – Inflammation of the Tonsils. Before we understand what tonsillitis is we need to know what Tonsils are and their functions. Tonsils are Simple Lumps or Balls of Lymphatic Tissue in the Back of the Oral Cavity on either side of the back of the tongue. Tonsils like other Lymph Nodes help in Immunity and fight against infection. But if these Tonsils get infected by Bacteria or Virus it leads to inflammation of the Tonsils. It is the Inflammation of the Lymphatic Tissue present on either side of the Uvula located on back end of the oral cavity. In simple terms it is Tonsils + Itis (Inflammation) – Inflammation of the Tonsils, which is caused due to Bacterial or Viral infection. Tonsillitis is often classified into 3 types based on the duration or the time for which the inflammation lasts. The different types of tonsillitis often is caused by different types of Bacteria or Virus. Tonsillitis is mainly Caused by Virus or Bacteria and rarely caused by Fungal infection. Tonsillitis which is caused by Bacteria and Virus is often transmitted through air via water Droplets. If the infected person sneezes or Coughs the water droplets (Saliva) containing Bacteria or Virus are carried into the air and when these come in contact with another person cause Tonsillitis. Hence Tonsillitis is affected more in children because of the close contact they have with other children at Schools. Tonsillitis usually presents as a Red, inflamed Swelling on the back of the throat. The Doctor usually asks you to open your mouth wide and put your tongue out as much as possible and with the help of a torch sees for the signs and symptoms of Tonsillitis. White spots and sores are a common occurrence on the swellings in the Tonsils area. In Case of Viral Tonsillitis: Inflammation of Tonsils, Cold along with runny and stuffy nose, sneezing, and coughing are seen more commonly. In case of Bacterial Tonsillitis: Inflamed Tonsils with Fever and Swollen Tonsils but without Cold and Cough. Tonsillitis along with Severe Fever and Swollen Lymph nodes without any Cold or Cough is commonly seen in Bacterial Tonsillitis and the Doctor will suggest you a Strep Test. 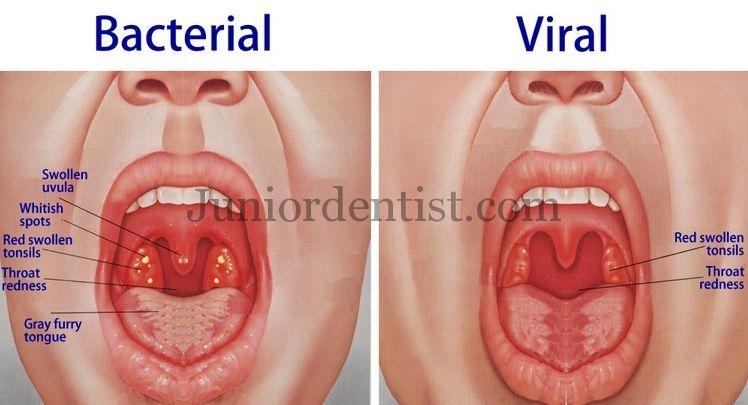 In Case of Viral Tonsillitis the Tonsils infection will be relieved on its own without any medication. The only medication required is for relieving you of the symptoms of pain and Discomfort which will be listed out later in this post. In case of Bacterial Tonsillitis diagnosis and Antibiotic Medication is necessary. In case of Streptococcal Tonsillitis or Pharyngitis Pencillins, Cephalosporins (Cefalexin, Cefadroxil) are prescribed but in case of Patients allergic to Pencillins and Cephalosporins are given Erythromycin. In case of Chronic Occurrence of Tonsillitis the Doctor might suggest you to go for “Tonsillectomy” which is the complete removal of Tonsils from your Oral cavity. Gargle with Warm water mixed with Salt in as many times as possible because of the isotonic nature of Salt the Bacterial infection is decreased and also helps in decreasing the Pain and discomfort. Thank you for this clear article, I now know to seek professional help and not to try and wait it out.